Nothing can end a hunt or fishing trip quicker than poor weather and unprepared outdoorsmen. Not only can it result in some pretty miserable experiences, in some situations not having the proper gear and be dangerous. So understandably, picking the proper clothing for cold weather hunts is of vital importance. Not only do we have to consider staying warm when picking our gear, but that will also need out clothing to be silent, flexible, and breathable. So, how does one go about selecting proper extreme cold weather gear for winter excursions? That’s what this article is going to outline. We will discuss the proper way to layer your clothing for cold weather trips as well as the types of material that work best for each layer and situation. The key to being comfortable in the outdoors during cold weather is in layering. Especially with hunting where there are going to be times when it is near or below freezing that you moving and sweating. By layering, you utilize different materials that function in different types of protection. It also gives you the ability to add or shed layers as needed. What’s important to remember about layering is that more is not better. You shouldn’t have so many layers that your movement is restricted as this can severely hamper your ability to hunt effectively. It’s equally important to remember that there is no one right combination to how you layer your hunting gear. It all depends on the level of activity as well as the temperatures. By being smart about your layers, regarding their material and functionality, you can limit the number of layers to four or less and be more comfortable than with six layers of clothing. Now that does not mean to limit yourself just because you’re afraid of constricting movement. You’re the one hunting through tough conditions and determining what you will need. If you’re hunting in weather well below freezing, you should layer up with additional articles of clothing. The great thing about layering is that they can always be removed. When layering it’s always best to go a layer more than you think might be needed. Here is a brief overview of the layers we will cover and their intended purpose. Base layer: Your base layer is going to be the clothing that is in direct contact with your skin. Optimally, this layer is going to deal with moisture control. You want a material that is going to be able to wick up sweat and dry quickly even with several layers on top. In extreme weather, such as subzero, even this layer needs to be highly thermal and insulating. Mid (Thermal) layer: For winter conditions, your mid layer should again have heat retention properties. Depending on the weather conditions, this might involve 2-3 thermal layers of increasing weight. Shell (Outer) Layer: The outer layer of your outfit should be able to protect you from environmental elements such as wind and rain. It should also be durable and camouflaged to blend in with your hunting area. As we go through the various layers and material available it is important to realize that when buying these products they are usually labeled as lightweight, medium weight, and heavy weight. This description is related to the thickness of the material. Depending on the temperature you might need to go with a lighter material for more breathability versus temps near zero where a heavy, more insulating layer is needed. Depending on your hunting situation, the best base layer can serve several purposes. It can be a moisture control layer or a thermal layer. The best material for cold weather hunting gives you both properties. If you are going to be doing a lot of walking during your hunts or know there will be some perspiration, it is important that your base layer can wick up this moisture. Even in milder conditions, a base layer that does not remove moisture from the body and dry quickly will cause rapid heat loss from the body. In temperatures ranging in the 30’s or 40’s where you are going to be doing a lot of cardio such as elk hunting or upland birds, focus more one moisture control and less on insulation as you can cover that in your mid layers. There are multiple fabrics that are excellent moisture control base layers. Wool works fine (merino), but some hunters have issues with discomfort with wool against the skin. Synthetic polyester materials such as nylon, polypropylene, and rayon are the most popular materials for base layers. These materials are excellent for all conditions, except the most extreme cold weather conditions (well below freezing). They are the absolute best for moisture control. A lot of outfitting companies also produce synthetic base layers that are designed to trap odor as well. As any hunter knows, this can be a huge advantage. If you are hunting in situations where you are going to be covering a lot of distance, and temperatures will be in the 25-40°F range, a synthetic base layer is recommended. Stay away from cotton! Everyone loves a cotton shirt, but cotton will trap moisture, and it takes more time to dry than wool or synthetic materials. Keeping a damp shirt up against your body is going to cause you to lose a lot of heat and put you in a dangerous situation in low temps. If you don’t think perspiration is going to be an issue during your hunt or fishing outing, then you might be better served by using an insulating base layer that we will cover in the next section. In extreme cold situations, you are never going to be stripped down to the base layer. Because of this, camouflage is not as important, and any natural coloring is fine. There is nothing wrong with camo, and most base layers designed for cold weather have hunters in mind. You just don’t have to base your decision on the best camo choices. If you are not interested in your base layer being a moisture control, then a good thermal base layer is needed. If you are hunting in temperature getting down in the teens and below where you need a thermal base layer one of the best options is going to be merino wool. Not only is merino wool a fantastic insulator but it also has great moisture control properties. This is not the type of wool you probably grew up around, thick, itchy, and uncomfortable on the skin. Merino wool has much smaller diameter fibers making them easier on the skin. This material provides insulation and is also able to wick moisture away from your body. It is also a good fabric for containing scent. The trifecta for hunting materials! Polyester fleece is a second material that is common in thermal base layers. It too provides insulation and resists holding moisture. On top this it is a cheaper option than merino wool but doesn’t provide as great of insulation, wicking ability, or breathability. Nylon is a third option for a good insulating base layer, and it also has excellent wicking properties. Even when needing a thermal base layer it is still important to go with a lightweight option. You can always go heavier as you continue layering and it gives you better temperature control. This layer is all about insulation. Depending on the temperatures you might opt for one or two mid layers. If you decide to go with multiple thermal layers, you should always layer the lighter clothing article closer to your body with heavier layers on top. There are a lot of options for mid layer clothing. Not only are there several materials that could be used, but a lot of hunters also prefer having some half or full zipper options to regulate temperature control. If going with a polyester base layer, a second light weight merino wool layer is great because it pulls the moisture further away from your body, insulates great, and is a second odor blocking layer. A lot of hunters also use nylon as a lightweight thermal mid layer. Nylon wicks away moisture and provides excellent insulation, but it is a poor odor blocker and is not breathable, so it does not dry quickly. Goose down pullovers offers incredible insulation and is a great second or third mid layer option. The biggest drawback is that this material should not get wet as it absorbs and holds water easily. A heavy fleece pullover or jacket is also a great secondary mid layer on top of a lightweight wool or fleece. Again, you just can’t go wrong with merino wool and a mid to heavyweight clothing article is a fantastic secondary mid layer. In fact, you will find a lot of hunters using only merino wool in their mid layer clothing and just increasing the weight of each piece of clothing. As you start getting to the outer layers, it is also important that you have the proper camouflage pattern to match the surrounding areas. This is not going to be an issue for you as the major outfitters have clothing articles in these materials in just about every pattern you can imagine. For the legs, a lot of hunters opt for only three layers, even in below freezing conditions. A good lightweight base and thermal layer along with a durable shell layer are enough to keep you comfortable without restricting movement. Of course, you have the final say and will be the one enduring the cold, so it is your best judgment. While it would be nice for your shell layer to also provide insulation, its main purpose should be to shield you from immediate environmental conditions such as wind, rain, or snow. Not only this, but it also must be rugged enough to withstand the scraping and beating it will take on hunts. While even inexpensive outer layer coats offer wind and rain resistance, you usually have to go up in the price range to get a heavy coat that offers some breathability. Gore-Tex is an exemplarily material for shell layers in hunting situations. It provides top water and wind resistance while also providing breathability. It is also rugged and a relatively quite material. There are several other shell layers similar to Gore-Tex, and all of these materials can get pretty pricey. Of course, you can always go with a goose-down or heavy weight wool or fleece lined jacket that has an additional layer of material that has been treated for water resistance. The problem is, these treatments usually break down over time, and the jacket will lose its hydrophobicity. If you are in extreme cold and dry conditions you could opt for a shell layer that is strictly for insulation purposes. Of course, in temperatures well below freezing or in situations where you are stationary most of the time insulation should be a bigger priority than breathability. There are countless heavyweight parkas and jackets that offer multiple linings of insulating material. Some even have electric heaters built into the lining! You can layer as best you can to keep your core warm, but cold extremities can be one of the most uncomfortable situations you will find yourself in when hunting in cold weather. We would be remiss not to mention how to go about picking the best socks, gloves, and headwear for hunting and fishing in the extreme cold. If your hunt mostly involves sitting in cold weather (0-20°F), then neoprene socks might be the best option for keeping warm. Again, if you will be moving quite a bit and perspiring, you need to think about not only thermal properties of the material but also the ability to remove moisture. Wet feet in cold conditions result in miserable hunting. Again, merino wool or other brands of smart wool are the best options for hunting as they provide insulation and remove any sweat. Depending on the temperature situation you can also layer your socks. Lightweight merino wool paired with a thicker wool sock can provide moisture control and insulation. Again, it all depends on your situation. For cold weather gloves, you usually have a tradeoff that you will have to decide on. A lot of the more insulated gloves are going to be thick material while the more flexible gloves are going to be thinner. As a hunter, flexibility in your hands is a must. If you’re on the move hauling gun and extreme cold weather gear, you are going to want to stay away from mittens. There are plenty of glove options, just be sure that they have an insulating lining and good gripping surface. For stationary, ambush type hunting, the “pop top” mittens are an excellent choice. Being able to remove the mitten portion when the time is needed allows you to keep finger flexibility while still having extra insulation when flexibility it is not needed. A lot of hunters and outdoorsman can deal with a lot of discomforts, but freezing ears might send them home. The trouble that comes with keeping the ears warm are is that your sacrifice hearing ability. An ability that is pretty useful when out in the woods. A fleece or merino wool neck gaiter is one of the best options for headwear available. It provides protection and insulation against a biting wind for your face and ears. It is also easy to remove from the ears and still stop a lot of heat loss coming up from your body. Besides gaiters, there are hundreds of options for beanies and caps with ear flaps that are made from the same insulating materials we have mentioned in the article. It’s all about your preferences, but don’t neglect this area of the body when it comes to cold weather hunting. A lot of the major hunting seasons in the United States occur during colder months, and in some situations, temperatures can drop to well below freezing. You have two options, stay home near the fire with a good book or use proper layering and bring back meat to the table. In these conditions, it is critical that you layer properly using materials that will control moisture and provide insulation. Depending on the weather you will also need to be ready to deal with rain, snow, and biting cold wind. 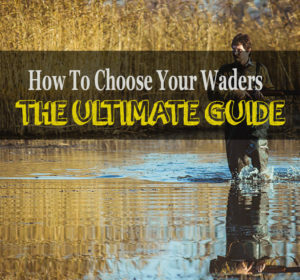 We hope that this article has provided you with a guide on how to layer properly to give you the maximum comfort and protection while maintaining your ability to be a predator in the field.